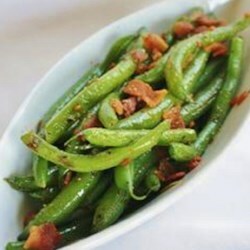 "Here's a change of pace: crispy stir-fried beans that are excellent as an appetizer or side dish. Green vegetables are rich in antioxidants and tied to lower risks for certain cancers." Add green beans, return to a boil and cook 1 minute; the beans should still be crisp. Drain the beans; don't rinse. In a large skillet or wok, add oil. Heat until very hot (the skillet is ready when a drop of water in the oil sizzles). Add beans and cook about 1 minute, turning often with tongs or spatula. Sprinkle on pecans and Old Bay. Turn the beans and pecans to coat with oil and spices; cook about 2 minutes more, or until beans and nuts are slightly browned. Salt to taste and serve. I never thought of using Old Bay on green beans. I loved it! I omitted the nuts and added bacon bits and it was great! I made this with the Spinach Stuffed Chicken and it was a great meal! Well, I'm getting old. Thought I had pecans, but didn't. Used almonds instead. Forgot the recipe called for BLACKENED Old Bay- didn't have any, so used regular Old Bay. Turned out great anyway!